Photograph of Hiroshima bomb casing declassified postwar. The Mark I LB "Little Boy" was 10 feet (3 m) in length, 28 inches (71 cm) in diameter and weighed 8,900 lb (4000 kg). No full test of a gun-type nuclear weapon had occurred before the "Little Boy" device was dropped over Hiroshima. The only test explosion of a nuclear weapon had been of an implosion-type weapon utilizing plutonium as its fissionable material, on July 16, 1945 at the Trinity test in New Mexico. There were several reasons for not testing the "Little Boy" device. Primarily, scarcity of uranium-235 compared with the relatively large amount of plutonium which, it was expected, could be produced monthly from the Hanford, Washington, reactors. Additionally, the weapon design was conceptually simple enough that it was only deemed necessary to do laboratory tests with the gun-type assembly (known during the war as "tickling the dragon's tail"). 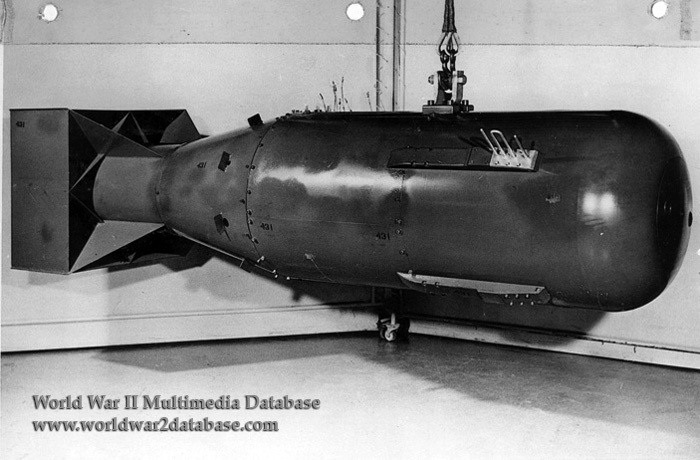 Unlike the implosion design used with the Nagasaki "Fat Man" bomb, which required very sophisticated coordination of shaped explosive charges, the gun-type design was considered almost certain to work without full testing. It successfully detonated over Hiroshima at 0815 Hours on August 6, 1945.